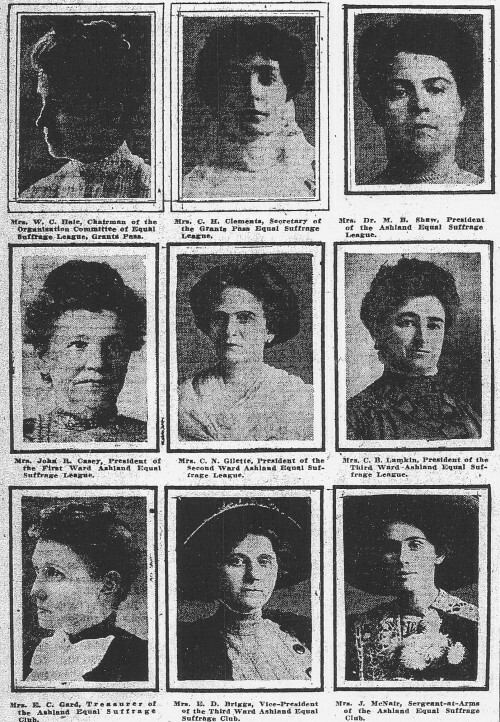 September 1912: Southern Oregon Rocks the Suffrage World with Coalitions (and Pictures!) . . .
By September 1912 suffrage activity in Oregon was in full swing. Local groups were organizing parades, rallies and speeches and spreading literature, buttons and banners. At the end of the month, activists thronged to hear Anna Howard Shaw, president of the National American Woman Suffrage Association, on her multi-city tour from Pendleton to Portland to the Willamette Valley and Southern Oregon. One of the main reasons that suffrage supporters gained a victory in 1912 was the creation of grassroots coalitions. There were 23 suffrage groups in Portland alone, and dozens across the state. Press coverage in September gives us new details about a very important regional organization—the Southern Oregon Equal Suffrage League and its local leagues in Ashland, Medford, Grants Pass and Klamath Falls. And pictures! 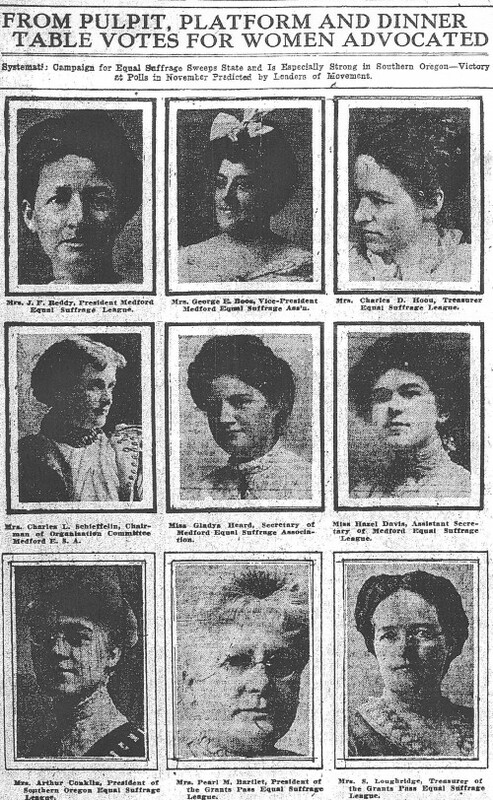 And—there are pictures—portraits of Medford, Grants Pass, and Ashland suffrage leaders. We’ll treasure them in their grainy newspaper form, of course, and hope that they will assist researchers in uncovering the originals, full names, correct spellings, and other information about them. Grassroots coalitions in Southern Oregon—another important reason that Oregon women achieved the vote in 1912. Do you have one of these images in your attic or know someone who does? Do you know something about these suffrage leaders? Contact us!